I actually made 6 different types of Christmas cookies this year! I am calling this year “The Year of the Frosted Cookie” because my husband requested 3 frosted cookies! But I am glad that he was able to come up with requests. When I ask him what he wants for dinner he says, “I don’t know”. When I asked him which cookies I should make, he came up with 4 ideas. I assembled this cookie tray to send to my husband’s business. My husband helped me decorate some cookies. I also prepared small plates for a friend and neighbors. My large freezer is my friend at times like this. I still have more in my freezer for the next time I want to make a cookie tray. I would just need to ice the ones that need frosting as I don’t put iced cookies in the freezer. Frosted Gingerbread Cookies – I know that mine do not look like traditional gingerbread men but this is how my husband remembers them from his childhood. (I made my own frosting with confectionery sugar, butter, and milk) I ice them before serving. Reindeer Spice Cookies (I made my own frosting with confectionery sugar, butter, and milk) I ice them before serving. Pumpkin Pecan Tassies My husband loves these and requests them every year. Sugar cookies (I made my own frosting with confectionery sugar, butter, and milk) I ice these before serving. Cream Cheese Spritz – I don’t like working with the cookie press – it always causes me trouble but I like the taste of these cookies and wanted a great tasting non-frosted cookie. 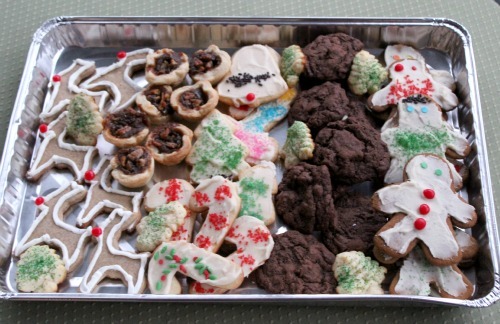 What types of holiday cookies do you make? This entry was posted in Bento / Cute Food, Food, Party Planning. Bookmark the permalink.